Your shin bone (tibia) is the bone at the front of your lower leg that runs from your knee to your ankle. Shin splint’s is a general term used to describe any condition that causes pain down the middle, or on either side of your shin. Exercise-induced pain usually manifests itself in the front aspect of the lower legs. The medical name for this is medial tibial stress syndrome. 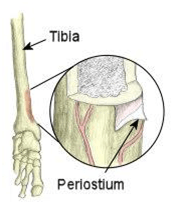 The underlying problem is inflammation of the outer covering of the bone (periosteum). Depending on the type of injury you have, the pain may come on gradually or you may have a sudden twinge of pain. Shin splints usually develop in people who do repetitive activities and sports – either during or after strenuous activity – that put a lot of stress on the lower legs, such as running, dancing, aerobics, gymnastics, football and hockey; i.e. sports with sudden stops and starts. Some soldiers also complain of shin splints during loaded marches. Redness over the inside of the shin (not always present). The pain is often worse when you do activities that involve supporting your body weight. You may feel pain along the whole length of your shin, or only along a small section. The pain may build up during exercise and it will become more severe the longer you exercise, and if you ignore it and continue exercising it can become extremely painful and force you to stop sport altogether. It is really important not to ‘run through the pain’, as the shin pain is a sign of injury to the bone and surrounding tissues in your leg. Continued force on the legs will make the injury and your pain worse. Instead, you should rest and take a break from the sport for at least two weeks. You can still exercise during this time off, but choose activities that will not put too much force on your shins, such as cycling or swimming. Compartment syndrome: this happens when your muscle swells. Your muscle is within a close compartment and so does not have much room to expand. When the pressure in your muscle increases it causes the symptoms of compartment syndrome. You participate in loaded marches, especially when unconditioned. You should rest your injury and think about what may have caused your shin splints. You should be able to recover fully from shin splints if you rest for at least two weeks. This means you should not do any running or ‘stop and start’ sports during this time, although walking, swimming and cycling are OK. Pain and any swelling can be relieved by raising your leg and holding an ice pack to your shin (try a bag of frozen peas wrapped in a tea towel). Do this for 10 minutes every few hours for the first two days. However, you should also consider the treatment options outlined below. Treatment for shin splints involves identifying training and biomechanical problems which may have caused the injury initially. Rest to allow muscles to return to their original condition and gradually return to training. Over-the-counter painkillers, such as ibuprofen or paracetamol, may also help by reducing the pain and inflammation. Follow the instructions in the patient information leaflet that comes with the medicine and if you have any questions, ask your pharmacist or medical professional for advice. Wear shock absorbing insoles in shoes as this helps reduce the shock on the lower leg. Check your trainers or sports shoes to see whether they give enough support and cushioning. Specialist running shops can give you advice and information about your trainers. An experienced adviser can watch you run and recommend suitable shoes for you. It is important that you think about how much exercise you are doing and if it is causing shin splints. You may need to reduce the amount of exercise you are doing or change your training routine. Use acupuncture, tape or soft tissue techniques that may help reduce pain. A podiatrist (a health professional who specialises in conditions that affect the feet) can provide advice about foot care. S/he can also supply shoe inserts (orthotics) to control the inward roll of your feet if necessary. If your shin splints are caused by compartment syndrome and the pain is severe, your medical professional may suggest an operation called a fasciotomy. This releases the pressure on the muscles in your lower leg. Talk to your medical professional or physiotherapist for more information. You can return to your usual activity after at least two weeks of rest, and only when the pain has gone. Increase your activity level slowly by gradually building up the time you spend running or doing sports. It is also important that you warm up and stretch before you start exercising. If the pain returns, stop immediately. A sports physiotherapist will be able to advise you on a suitable graded running programme. You can ask your medical professional for a referral on the NHS or arrange an appointment yourself privately with a physiotherapist or medical professional specialising in sport and exercise medicine. Build up your activity level gradually. A nerve problem in your lower back, known as radiculopathy. The National Institute for Health and Clinical Excellence. Bouchard, C., Blair, S.N. & Haskell, W.L. (2012) Physical Activity and Health. 2nd ed. London: Human Kinetics. Knapick, J.J., Bullock, S.H., Canada, S. Toney, E., Wells, J.D., Hoedebecke, E. & Jones, B.H. (2004) Influence of an Injury Reduction Program on Injury and Fitness Outcomes among Soldiers. Injury Prevention. 10, pp.37-42. Elliot, B. & Ackland, T. (1981) Biomechanical Effects of Fatigue on 10,000 Meter Racing Technique. Research Quarterly for Exercise and Sport. 52(2), pp.160-166. Nyland, J.A., Shapiro, R., Stine, R.L., Horn, T.S. & Ireland, M.L. (1994) Relationship of Fatigued Run and Rapid Stop to Ground Reaction Forces, Lower Extremity Kinematics, and Muscle Activation. Journal of Orthopaedic and Sports Physical Therapy. 20(3), pp.132-137. Mair, S.D., Seaber, A.V., Glisson, R.R. & Garrett, W.E. (1996) The Role of Fatigue in Susceptibility to Acute Muscle Strain Injury. American Journal of Sports Medicine. 24(2), pp.137-143. Candau, R., Belli, A., Millet, G.Y., Georges, D., Barbier, B. & Rouillon, J.D. (1998) Energy Cost and Running Mechanics During a Treadmill Run to Voluntary Exhaustion in Humans. European Journal of Applied Physiology. 77(6), pp.479-485. Stamford, B. (1996) Cross-training: Giving Yourself A Whole-body Workout. Physician and Sports Medicine. 24(9), pp.15–16. Wilkinson, D.M., Blacker, S.D., Richmond, V.L., Horner, F.E., Rayson, M.P., Spiess, A. & Knapick, J.J. (2011) Injuries and Injury Risk Factors among British Army Infantry Soldiers during Predeployment Training. Injury Prevention. 17, pp.381-387. Rolfe, A. & Boyce, S.H. (2011) Exercise Promotion in Primary Care. InnovAiT. 4(10), pp.569. Albert, C.M., Mittleman, M.A., Chae, C.U., Lee, I.M., Hennekens, C.H. & Manson, J.E. (2000) Triggering of Sudden Death from Cardiac Disease Causes by Vigorous Exertion. New England Journal of Medicine. 343, pp.1355-1361. Bookman, A.A., Williams, K.S. & Shainhouse, J.Z. (2004) Effect of a Topical Diclofenac Solution for Relieving Symptoms of Primary Osteoarthritis of the Knee: A Randomized Control Trial. Canadian Medical Association Journal. 171(4), pp.333-338. NICE (National Institute for Health and Clinical Excellence) (2008) The Care and Management of Osteoarthritis in Adults. London: NICE. Bruckner, P. & Khan, K. (2006) Clinical Sports Medicine. 3rd ed. Australia: McGraw. Carr, K. & Sevetson, E. & Aukerman, D. (2008) How Can You Help Athletes Prevent and Treat Shin Splints? Journal of Family Practice. 57(6), pp.406-408. MacAuley, D. (2007) Oxford Handbook of Sport and Exercise Medicine. Oxford: Oxford University Press. pp.270-271. Thacker, S., Gilchrist, J. & Stroup, D. (2002) The Prevention of Shin Splints in Sports: A Systematic Review of Literature. Medicine Science Sport Exercise. 34(1), pp.32-40.